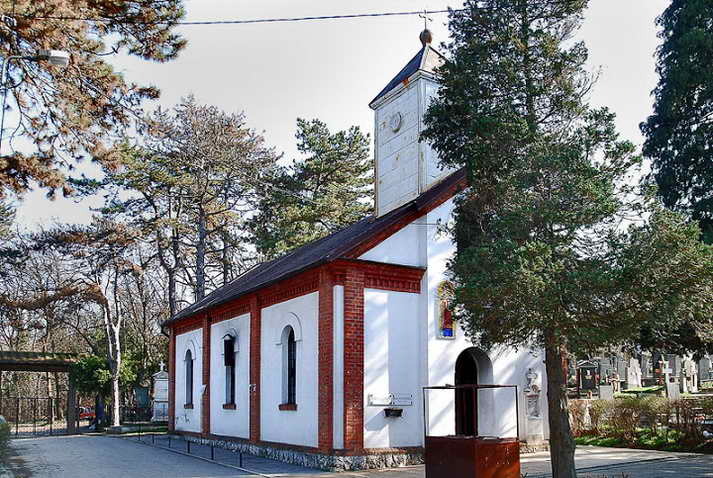 the temple of holy martyr Tryphon at Topchider graveyard in Belgrade, Serbia. The Martyr Tryphon was born in Phrygia, one of the districts of Asia Minor, in the village of Lampsacus. From his early years the Lord granted him the power to cast out demons and to heal various maladies. He once saved the inhabitants of his native city from starvation. St Tryphon, by the power of his prayer, turned back a plague of locusts that were devouring the grain and devastating the fields. St Tryphon gained particular fame by casting out an evil spirit from the daughter of the Roman emperor Gordian (238-244). Helping everyone in distress, he asked only one thing from them: faith in Jesus Christ, by Whose grace he healed them. When the emperor Decius (249-251) assumed the imperial throne, he began a fierce persecution of Christians. Someone reported to the commander Aquilinus that St Tryphon was boldly preaching faith in Christ, and that he led many to Baptism. The saint was arrested and subjected to interrogation, during which he fearlessly confessed his faith. He was subjected to harsh tortures: they beat him with clubs, raked his body with iron hooks, they scorched his flesh with fire, and led him through the city, after iron nails were hammered into his feet. St Tryphon bravely endured all the torments without complaint. Finally, he was condemned to beheading with a sword. The holy martyr prayed before his execution, thanking God for strengthening him in his sufferings. He also asked the Lord to bless those who should call upon his name for help. Just as the soldiers raised the sword over the head of the holy martyr, he surrendered his soul into the hands of God. This event occurred in the city of Nicea in the year 250. He is greatly venerated in the Eastern Orthodox Church, in which he is also the patron saint of gardeners and winegrowers In Serbia. 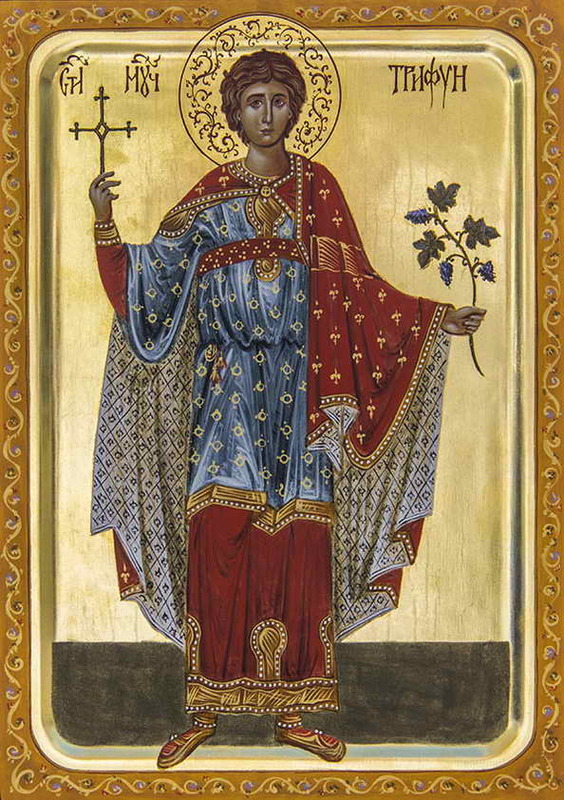 In Serbia, Macedonia and Bulgaria, St Tryphon is celebrated by vine growers. His feast day is on 1 February [O.S. 14 February] in the Eastern Orthodox Church. Your holy martyr Tryphon, O Lord, / through his suffering has received an incorruptible crown from You, our God. / For having Your strength, he laid low his adversaries, / and shattered the powerless boldness of demons. / Through his intercessions, save our souls! By the power of the Trinity you destroyed polytheism to the ends of the earth, / and you were honored by Christ, all-glorious Tryphon; / having conquered tyrants tyrants through Christ the Savior, / you received your crown of martyrdom and the gift of divine healing, for you are invincible.